• Eaton Vickers VQ series is fixed displacement and balanced type vane pump. Available in both 12 vanes design for industrial application with quiet operating and 10 vanes design for mobile application with higher pressure and wider range of speed. They are widely used in hydraulic systems for machine-tools, presses, die casting machine, engineering, plastic injection molding and other machineries. • Its interchangeable with original Vickers pump of the same model. •The inlet or outlet ports can be rotated through increments of 90°in relation to each other, providing application flexibility and easy installation. 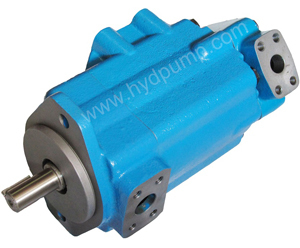 • With the cartridge independent of the shaft, allowing for easy change of flow capacity and field servicing without removing the pump from its mounting. • For the cartridge kit of VQ Series, the flexible plates are inserted between the support plates and the rotor. The flexible plates are assembled with the bronze facing towards the rotor to improve cold start capability and compensate thermal expansion in the rotor. This makes VQ Series particularly suited for mobile application. 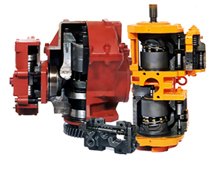 In all pumps, except the rear pump of triple pumps, fluid flow is developed in a cartridge which consists principally of a cam ring, rotor, ten vanes, and unique side plates and support plates. The bimetallic flexible side plates are located on each side of the rotor with their bronze face toward the rotor and their steel face toward the support plate. 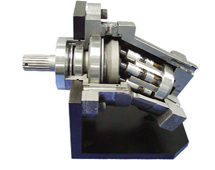 Two cavities in each support plate hold high pressure oil against the flexible side plate, thereby hydrostatically balancing the flexible plate and providing optimum clearance with the rotor. For a combination of maximum horsepower in a small package, high efficiency, serviceability and economy, Vickers “high output” pump is unequalled anywhere in industry. 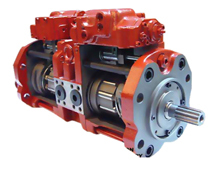 VQ Double pumps provide a single power source capable of serving two separate hydraulic circuits, or of providing greater volume through the combined delivery of both sections. 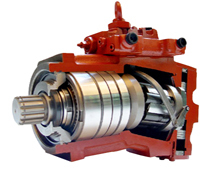 In either type of application, two pumps in a single housing result in a more compact, simple installation and can be driven through a single shaft coupling. The pump cartridge described under design features is easy to service and can normally be replaced in ten minutes or less, without removing the pump from its mounting. A small stock of cartridges can serve many pump models on a variety of vehicles. 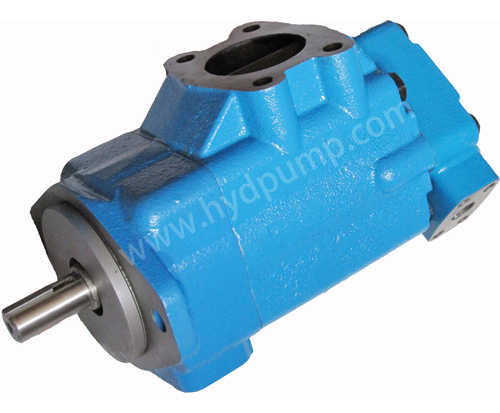 Maximum rated pump speeds are based on one atmosphere of inlet pressure (14.7 psi) with the pump at sea level and operating with SAE 10W oil at 38_ to 82_ C (100_ to 180_ F), unless otherwise specified. Minimum recommended starting speed, under fluid conditions stated above, is generally 600 r/min. However, the pump size, system characteristics and environmental conditions can raise or lower this speed. A lower speed can often be achieved after the pump has primed. If low starting or operating speeds are required, consult your Vickers representative. Recommended inlet pressure is 0 to 0,34 bar (0 to 5 psi) gauge. Inlet pressure should not exceed 1,38 bar (20 psi). Inlet depressions should not exceed 0,17 bar (5” of Hg or 12.2 psi). Pumps should not be operated at or near rated pressures at idle speeds for extended periods. Localized overheating and damage can result. Never assume pumps in a double, triple or thru-drive pump assembly can be simultaneously loaded to rated pressure. Shaft loading must be checked for excessive torque and side loads. A pressurized reservoir system does not always assure a positive (supercharge) pressure at the pump inlet. Vacuum at the pump inlet can result during cold start-ups. Avoid high speeds until the circuit has warmed and supercharge pressure actually exists at the pump inlet. When vacuum breaker pressure caps are used on the reservoir, exercise implements to obtain reservoir pre-charge.